Storage: keep in cool, clean, dry, ventilated, no peculiar smell, no pollutant, no direct sunlight place. This sort of advice is common. It’s especially prevalent when looking at vendor descriptions on ebay or amazon or whatever. For a novice it all looks pretty uncontroversial, and for certain parts of the world it’s pretty good advice. But there are some real issues when this advice is directly applied to a drier climate. The first issue is with cool. This advice seems translated and copy/pasted from a place where temperatures are often higher. It’s important to keep in mind that places where pu’erh has been stored for the longest are hot. If you interpreted storing your tea “cool” relative to room temperature you may end up doing something dumb, like storing your tea in the garage at sub 50F degree weather for an extended amount of time. There is also ventilated. Airflow is a hotly contested topic in western circles, but leaving your tea in an open air environment in the west where room temperature air is a lot drier is not great for the long-term outlook of the tea. 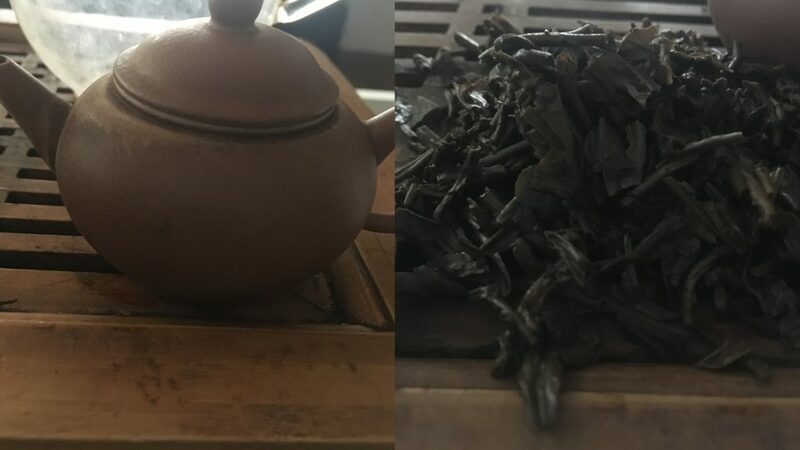 If you just read product descriptions such as the one above, you’d think storing pu’erh in the west is pretty easy and assume that it is more of a sure thing. There’s a monetary incentive for vendors to portray it that way. It’s their job to sell you tea, and you’d be more likely to buy if you think storing pu’erh is easy.. I’ve noticed that western pu’erh vendors have gradually shied away from even giving basic storage advice. This is probably smart. The above advice is simplistic and was not really intended for western eyes or climates. Storage preferences are also real and subjective and by not actively volunteering advice helps to prevents certain responsibility if the consumer doesn’t end up liking the results. An early 2000s Anonymous Factory Production. When I first traveled to Taiwan and Hong Kong in Autumn 2015, it was my first time in that part of the world. I’d been to east Asia a few times, but never as far south as Taiwan. As soon as I stepped out of the air-conditioned airport my glasses fogged up from an immediate blast of heat and humidity. This was definitely not a familiar feeling. After a week or so, I got much more acclimated to the climate and it was a lot less jarring. Spending this time abroad my mind inevitably turned to the difference in this climate and pu’erh storage. If you bring up that you’re using a pumidor or try to explain some sort of sealed setup to a tea person or a tea owner in a place like Taiwan or Hong Kong, there’s a good chance you’ll get a confused look. You may even get warned or reprimanded. Even though many of these owners are very experienced with tea and storage, western pumidors are not a type of storage that is normal or necessary for most vendors in east Asia. One observation: Vendors are thought leaders in many ways, but I often feel like when it comes to storage the conversation is dominated by hobbyists (in the west). Before I went to Taiwan I knew that there was a large difference in the climate for Taipei and Seattle, but my arrival to Taiwan gave it to me in a real and much more literal sense. My glasses fogged up and I had to take off a layer of clothes. Even staying indoors in the 9th floor of an apartment with air conditioning, the indoor temperature and humidity were much higher and much different than what I was was used to during Seattle at any point in the year. I’ve carried a hygrometer with me on past trips simply to confirm what the body feels. Seeing the difference it’s easy to see why different solutions are recommended. Putting tea on a shelf in Taipei is totally different from Seattle. I suspect one reason we are occasionally treated to not so great storage advice from people you’d think should know better is that people in Taiwan or elsewhere can be pretty clueless about western climates. Drying out tea in Taiwan is not a primary concern. In the west we spend time fantasizing about how the conditions are in east Asia for pumidor. The reverse is not true true and if anyone in Taipei or Guangzhou is really thinking about the possibility of aging tea in the west, they’re certainly in a small minority. I’ve seen anywhere from 15-40RH storage actively storage encouraged by vendors as an ideal by dealers who sell pu’erh in Taiwan. The traditional storage of pu’erh is quite wet and uses very humid and hot conditions. Drier conditions are currently more popular, but it’s important that people don’t overread into the dry aspect. Dry is really relative to what it previously was. It’s definitely not desert storage. In the case of Vesper Chan (famous for dry storage), it was stored more dryly within Hong Kong, a very hot and humid humid place. Different climates and conditions mean different solutions. We shouldn’t necessarily expect a good, intuitive response on questions of storage from people or vendors whose most common problems are so different from ours and don’t spend much time thinking about Michigan winters. What about places in Asia where the conditions may be different and closer to western conditions? China and Asia are huge places with an equally large variety of climates. The influence we get from Asia tends to be outsized in specific hotspots, like Taiwan, Hong Kong, Malaysia, Kunming, and Guangzhou. With the exception of Kunming, these all have hotter/humid climates. There are differences between Kuala Lumpur and Taipei’s climate but they are more similar to each other than to New York. And what about Kunming? Even though it is obviously an extremely important location for the pu’erh industry, the storage is slower and since pu’erh was mainly for export it lacks the history of Hong Kong. For better or worst, Kunming aged pu’erh is still dismissed by a large portions of the western audience as slow and the conventional wisdom certainly doesn’t put it as a an exemplary example of tea storage. And what about elsewhere? There are large cities like Shanghai, Beijing or even Seoul. Matt has (correctly IMO) pointed that central and northern China also store pu’erh. Interestingly he says that many places have started to seal their tea. I think this is an important point and shouldn’t be dismissed outright. Some of these area’s climates aren’t as dissimilar to western climates in ways that Hong Kong or Malaysia are. That being said, they also come with a much shorter collective history in storing tea than say Hong Kong. It may work, but it also may not. I’m personally not at all convinced that the majority of pumidors will work that well. Will 50% work? 80%? 20%? It’s frankly hard to say, but when considering longish timespans there is a lot that can go wrong. I’ve tried tea from around five different western setups (pumidors, wine storage, etc.) that have stored the tea for around a decade, and four or five more that have stored the tea for 6 or 7 years. The teas are generally on the dry-end, with the weaker examples having picked up some off-aromas. This is an extraordinarily low sample size and it’d be very foolish to jump to any conclusions and with so few examples, as we’re still working in a lot of theoreticals. Pumidors are one, likely highly imperfect way to work with and manipulate a drier climate. They are also inherently a hobbyist solution. Even in the western world, vendors never store tea this way. Why not? I think it largely comes down to the quantity of tea. I’m personally not bothered by this because vendors deal with larger stocks and they can store their tea in a room or a larger area that will maintain a reasonable humidity. Pumidors offer the flexibility of working with a much smaller amount of cakes which makes them inherently a hobbyist solution. Pumidors can be done in a way where there is relatively low mold risk. Most times the simplest explanation for mold are the correct one. If you store pu’erh at 75F/70RH you have at least some mold risk. In that case it’s not an iherent problem with the pumidor, it’s the parameters you’ve chosen to follow..
Pumidors increase mold risk vs. storing it in a cardboard box. It might be slow but tea will age in some capacity in the west. How storage will turn out in the long-run for pumidors. Where in the spectrum of wet to dry the storage will be? I’ve stored my tea for nearly five years but am still not totally sure how to place it. I think most western storage will end up being dry storage. Will it resemble Kunming? Drier? Wetter? Small differences like a few points in temperature or RH may end up making a big difference over time. There is a lot of uncertainty, and I suspect there will always be. Airflow. There is so much contention around this topic. Keeping in mind that fans are mainly used in places where there is high mold risk rather than a dryness risk, I’m not convinced it’s necessary but I’m also not really sure one way or the other. Interesting article and something I’ve been pondering since I started watching your video. I live in Arizona and the monitor the humidity or lack thereof constatntly – to dry and I have problems breathing. As for my tea, I’ve never really given it a thought until I pulled a can of Pu’erh I couldn’t stomach six years ago from the back of my cupboard and discovered it was now one of my favorites. Then I saw your videos and all your storage methods. Of course, I immediately wanted to jump on the bandwagon and have bookmarked a number of vendors and teas I want to buy try and/or store (thanks for all tips). But all your different storage methods, left me well puzzled. Unlike say a cigar where having it to dry will spoil the experience, tea gets rehydrated. Right now I’m wondering, what’s ideal? I’ve lived in the Pacific NW and I would be concerned stored cakes molding there – here not so much. Is humidity important for preserving the flavor or enhancing it over time? An avid composter of all my tea leaves and scraps for my tomatoes, my gut reactions is that the less humidity the better. Thanks for the comment. Generally speaking the conventional wisdom is that too dry is pretty bad for pu’erh. Too wet is also bad.. But the more traditional forms of pu’erh (traditional storage) use a lot of heat and a lot of humidity. I think that’s an important anchor point, because wet and dry are relative terms and most of the west is considerably drier than places where pu’erh is normally stored. Even in the PNW, if I were to more naturally store my tea I’d be much more concerned with them drying out rather than mold. Given how I store it, I think about both! I think that you’re right in thinking that when all is said and done, well stored tea in the west will be more of a range of different storage outcomes along a continuum from vey dry stored to,,,something not as dried, whatever that is. This will make it very difficult to place teas for discussion and comparisons in the future as these teas find their way out in the world. Maybe a new nomenclature is needed to better address this issue. Rather than just “traditional “ or “dry”, maybe something more descriptive. What is needed are accepted benchmarks to compare to that all would recognize and understand. I do not know what that should be but storage location and duration might be part of it. I could see that this could become complicated. However, we need a way of at least getting in the ballpark for expectations. In the end you still need to evaluate the tea for yourself. Great comment and absolutely agree. It’ll be interesting and probably pretty messy trying to pick up all the pieces of western storage when trying to evaluate it. When people try one tea stored in a certain place and form absolute conclusions, I’m sure we’ll be treated with some very bad hot takes at some point. I’m not sure how we’ll eventually get good benchmarks. Perhaps certain vendors that have US stored for a while? Some food for thought. Personally I’ve been storing in my Pumidor. I bring my the RH to 70% and hold it there for a couple months then let it naturally drop to 50% then repeat the process. I keep temp at 65-70F since I have my cigar humidors and whole leaf tobacco storage in the same room which suffer the same molding problems at 75+. Late to this party but wtf. One thing that I think escapes attention, in discussions of East Asia storage (particularly wrt the well-known locations like Hong Kong) is that people look up weather & climate info on the internet and say “OMG 70+% RH all year round!” and plan their storage attempts accordingly. But these numbers are for outdoor weather stations. The raw climate data where I live (SE Florida) looks an awful lot like HK (we have less rain). I store my tea in my garage, which I guess to be a fair approximation of a non-air-conditioned warehouse: the air temp is typically 10°F cooler than the weather report, and the RH is less than outdoors by 10-20%. I’ve just been looking over my data (consisting of pics taken of the humidity monitor at random times, and damn there are fewer of them than I thought) and seeing conditions that range from 53-83%RH (and the high end of that only happens when there’s been a lot of rain, a few days/year) and temps from ~65-85°F. Again, the extremes of these ranges are extreme, and hit only a few days in a year. A lot of times I see people talking about trying to keep their pumidors at 70+% RH, and I think those people are asking for trouble. 60-65% is probably more like it. As for temp, warmer is probably better, up to about 80°F based on Malaysia-stored teas I’ve tasted. One thing I wonder about with pumidors having artificial humidity and temp, is how well-engineered for the long term they are likely to be. 10 years is a long time to expect a reptile terrarium heater to keep going, and a long time to be messing around with adjustments every week. I think you’re absolutely right about people reading too much into outside weather conditions. There’s really a large difference and I think people read too much into both eastern and western outdoor climate data. That being said, it’s also difficult to get vendors to divulge specific parameters when talking about how they store it, so outdoor conditions at least give you an idea of the hand that you are working with. I have a couple more posts I’ve been working on that tackle the 70 vs. 65RH issue a bit more in-depth. My feelings aren’t too off from yours. 70RH might be safe, but there’s significantly less buffer zone and the odds of stuff going wrong particularly for a larger stash that isn’t checked regularly are quite a bit higher. Things like equipment malfunction, drastic changes, or just measurements being off may be enough to cause a disaster.